Meditation is one of those concepts that seem to be something rather vague. In the minds of spiritual seekers, there are many different opinions about what meditation is. This article attempts to clarify this from a linguistic, historical and scientific points of view. The very word "meditation" is of Western origin and comes from the Latin “meditation”, more precisely from the verb “meditari”, which in different contexts means “to think”, “to contemplate mentally”, to “develop ideas”, but its main meaning is “to think”. In the Old Testament hāgâ (Hebrew: הגה) means not only to sigh or murmur, but also to reflect, to think, mentally contemplate. When the Torah was translated into Greek, “haga” was translated as “melete”. In the Latin Bible, haga / melete was translated as “meditatio”. The use of the term meditatio as part of a formal, stepwise process of meditation goes back to the 12th-century Carthusian monk Guigo II. Further in Catholicism the idea of "meditation" is gradually filled with prayer content. In the future, there was a religious simplification and ritualization of that mental process, which was once quite a definite practical psychotechnical activity. The words "miraculous", "divine," "absolute," and so on were added to the description of meditation, although in the original sources there was no such a context. Since the 12th century, the western term "meditation" has gradually been diluted and distorted, and now it is misleading that meditation is a dreaming, listening to pleasant music with the sounds of nature or a prayer. Although even in ancient, religious interpretation, meditation was a certain mental process. Later the term "meditation" was logically applied as a translation of the name of eastern spiritual practices, called in yoga "dhyana", in Chinese Buddhism - "chan", in Japanese - "zen". In the East, meditation is primarily understood as dhyana. This is the Sanskrit word for the seventh stage of the eight-step raja yoga, which is based on the "Yoga Sutras" of the holy sage Patanjali and refers to Hinduism. The term "raja-yoga" is a retronym introduced in the XIV century in "Hatha Yoga Pradipika" to establish the difference between a school based on the "Yoga Sutras" and a new movement in Hatha Yoga. Until the 14th century, yoga meant what is now called raja yoga, and until the tenth century, hatha yoga was not known. In Buddhism, with its variety of meditative techniques, the yogic dhyana is most consistent with samatha (or “shamatha”; in Sanskrit). In the Pali language, “shamatha” is called “samatha”, in Tibetan – “shyiné” (“shine”). It is dhyana and shamatha that are the basis of a great variety of different techniques in yoga and Buddhism, which are also called meditations for lack of other lexemes in Western languages of Western cultures, in which there was no spiritual quest on such a scale as in the East. In yoga in the West, meditation traditionally includes such continuations of dhyana as samadhi and samyama. In addition, various lesser known practices of individual directions of Hinduism are also included in meditation, although they are not only quantitative (in duration), but also qualitatively different from dhyana. In India, all these subsequent steps and practices have only their Sanskrit names, or they are derived from Sanskrit - without using words such as meditation or dhyana. Although samyama looks like a meditation, it can only be called so to please Western students. For Indian yogins, samyama is samyama, not abstract meditation. Attempts to call samyama and other complex practices as meditation are similar to as if a geologist would call all minerals simply as stones. In Buddhism in the West, such practices as vipassana (in the Pali language, in Sanskrit – vipashyana (vipaśyanā), in the Tibetan language - lhagtong) and numerous visualizations are traditionally also referred to meditation. At the same time, these practices are more diverse and more complex than a simple shamatha. For Buddhists, all these practices have their names in Oriental languages, and the "generalized" abstract term "meditation" by Tibetans, Burmese or other Eastern non-English speaking Buddhists is not used. This is similar to how Indian Hindus do not use the Western term “Hinduism”. The term "Hinduism" appeared only at the beginning of the XIX century, and the Hindus call their religion "sanatana-dharma" (in Sanskrit). Interestingly, the Buddhists of the East call their religion "dharma" (law, teaching) or "Buddha-dharma" (Buddha's teaching). The term "Buddhism" was coined by Europeans in the 19th century. Looking at all this leapfrog with the Western names of Eastern concepts, it becomes clear that it is useless to investigate the meaning and origin of the Western word "meditation". Instead, it is needed to explore such concepts as "dhyana" or "shamatha". If you look at the dictionaries, then the problem is that all the available Sanskrit dictionaries were compiled by mleccha-Europeans, and not before the XIX century. The first and most famous Sanskrit-English dictionary was compiled by Monier-Williams, first published in 1872 and reprinted in 1899. Sir Monier Monier-Williams became a professor of Sanskrit at Oxford University in 1860. In this post he actively advocated the preaching of Christianity in India, stating that one of the goals of Oriental studies as a science was to be the conversion of Hindus into the Christian faith. In his book "Hinduism" Monier-Williams predicted the early termination of the existence of Hinduism and called on Christians to stop the invasion of Islam. Given the views of the British sir on Hinduism, it is difficult to fully trust the translation of the Sanskrit word “dhyana” in his dictionary. If you enter the word “dhyAna” (“dhyana” in the Sanskrit Kyoto-Harvard Convention) in the online dictionary of Monier-Williams, then it will be translated as "meditation, thought, reflection, (especially) profound and abstract religious meditation". If you enter the word "zamatha" ("shamatha" in the Kyoto-Harvard Convention), then it will be translated as "quiet, tranquility, absence of passion". After reading the translations of the words "dhyana" and "shamatha", the essence of meditation does not become clearer. If you enter the word “samadhi” in the Sanskrit-English Monier-Williams dictionary, then you get a set of derived values such as "wholeness, completeness" and even "tomb of a saint" instead of the literal meaning of this word. The word "samadhi" consists of two Sanskrit words "sama" and "dhi". "Sama" literally means "equal", "same", "equilibrium", "equidistant from extremes". The Sanskrit word "dhi" has many meanings and is used in a large number of complex words. Among its meanings are mentioned 'understanding', 'reflection', 'religious thought', 'mind', 'design', 'intelligence', 'opinion', 'meditation', 'imagination', 'notion', 'intellect'. The Sanskrit word "buddhi" with this root usually translated as "the activity of consciousness, intellect". Interestingly, "buddhi" is traditionally incorrectly translated as "intellect", as interpreters in context understand that it is something higher than the "manas"-mind (and is often referred to as something separate from the mind) but there is no exact equivalent in worldly Western languages for the concept of "buddhi". In English, the suitable equivalents for buddhi is the sapience, wisdom, acumen, gumption or sagacity. At the same time, the intellect is an aspect of the still inert mind, albeit the supreme one (of mind). Buddhi corresponds to the fourth body (vijnanamaya-kosha), while the mind to the third (manomaya-kosha). Vijnanamaya-kosha and anandamaya-kosha (the fifth body of the five) are built by meditations and other things, and provide further (in comparison with the mode of life of the median human being) the development of the soul and consciousness. In other words, the state of samadhi is the state of a balanced consciousness. It is the tightrope-walking of consciousness, when it resides in equilibria, not skipping a balance and not falling into one of the extremes. This is a state in which the mind stays only as a "transparent" observer, without coloring by its activity the perception of the world around it and not labeling with its own meanings. Naturally, for a long stay in this state it is necessary to train a lot. 1.1. So, this is instruction in yoga. 1.2. Yoga is the curbing of the vritti (unrest, disturbances) inherent in the mind. 1.12. It (mental unrest) is hampered by practice and detachment. 1.13. Abhyasa (practice) is the effort necessary to ensure the calm of the unrest of the mind. 1.14. This practice will be successful with constant reverence, continuous for a long time. 1.34. At your choice, the balance of the mind can be obtained even by exhaling and delaying prana (breathing). 1.35. Or mental calm is caused by the activity of higher feelings. 1.36. Or [by contemplating] the inner light (jyoti) that is free from suffering. 1.37. Or the mind chooses as an object for the concentration those who do not have desires. 1.38. Or, depending on the knowledge of nocturnal dreams. 1.39. Or, if desired, through meditation (dhyana). 1.41. When the disturbances of the mind are under control, the mind becomes like a transparent crystal and acquires the ability to assume the form of either the cognizing, or the act of cognition, or the object of cognition. 1.44. Thus, meditation and supermeditation (nir-vicara) are described, which has its object subtle. 2.45. Samadhi (awareness) can be achieved by making the Lord the goal of all actions. 2.46. Asana, the pose, should be stable and comfortable. 2.47. The key to success in this regard is practice with effort, which becomes progressively easier, combined with deep contemplation (samapatti). 2.54. Disconnection (pratyahara) is that through which the senses do not come into contact with their objects, but follow the nature of the mind. 3.1. One-pointedness (dharana) is the unshakable mind. 3.2. The continuation of this mental effort is meditation (dhyana). 3.3. This same meditation, when there is only the consciousness of the object of meditation, but not of the mind, is samadhi (awareness). 3.4. The three together (dharana, dhyana and Samadhi) constitute samyama (exercise in self-control). 3.5. After mastering this (self-control) comes prajna (light of wisdom). From all that is quoted it is clear only that meditation is the next stage of a certain mental effort after attaining the unshakable mind, that is, thoughtlessness. Just as it is impossible to practice samyama without first mastering the dhyana, so it is impossible to practice dhyana without first attaining the state of thoughtlessness. Thoughtlessness, of course, does not automatically mean a state of meditation, but without it meditation for beginners is impossible. Thoughtlessness is easy to train at any time, when there is no need to talk or think, and, of course, when you remember about this training . This can be done dozens of times during the day, and this is one of the most effective approaches to train the silence of the mind and the preparatory stage of meditation. In addition, thoughtlessness has its own levels of subtlety, which also affect the level of meditation attained. In addition to thoughtlessness, it is necessary that "the mind becomes like a transparent crystal", that is, it was not engulfed by any unrest and kept the clarity of consciousness. The blunted state of consciousness, which in Buddhism is called the "sinking of the mind," does not allow a tired or drowsy mind to be in a state of meditation. In such a state, thoughtlessness is possible, and even some blunted form of self-control is possible to track the absence of thoughts, but a sleepy, almost sleeping mind can’t remember what is happening for longer than a few seconds, and this is definitely not meditation. The excitement of the mind also hinders meditation, because in this case the stream of thoughts and various unrest in the mind becomes too pushy. Buddhism has its own advices for such cases. For example, with drowsiness, you should look down, and when excited - up (even if you meditate with your eyes closed). Meditation is like an exercise in equilibrium. In addition to the basic requirement of thoughtlessness, meditation is a subtle mental balance between an agitated and drowsy mind. In a balancing act, you have to learn to notice the subtle moment of balance, and learn to maintain this balance with minimal efforts, because they are most effective, least costly energetically, and provide the best balance. Mastering meditation is very much like training an equilibrist, but instead of maintaining the balance of the physical body, a balanced state of the serene mind is maintained. Just as you can not immediately learn to walk on a rope, so mastering meditation requires a long training. Beginners constantly skip a balanced state of a serene mind, which is interrupted by thoughts, emotional instability or mental fatigue. If we consider thoughtlessness (as one of the properties of dharana) as a prerequisite for meditation, then a further transition through long practice to an even subtler state of thoughtlessness (“thoughtlessness-2”), or a truly clear and unshakable state of mind on a subtler and deeper level of self-control, means the transition to the state of meditation itself. In the Yoga Sutras, this is dryly stated as follows: “3.2. The continuation of [this] mental effort is meditation (dhyana).” And although this definition is rather vague, it is really difficult to say more precisely. To attain the state of meditation, it is actually necessary to do once again what was practiced at the dharana stage, only at a subtler level of self-control, ensuring even greater purity of mind. As the state of meditation in a prolonged form at all times was available only to the smallest part of Indian society, even in Indian languages, due to the lack of demand in the society for such terminology, the semantic concepts, which could be used to describe the state of meditation completely and accessibly, were not formed. The definition given in the above quotation from the Yoga Sutras describes the state of meditation beautifully and simply, but at first it can be confusing to be uninformative, and it becomes really understandable only after a long practice of meditation. In fact, everything depends on your regular training and perseverance. Meditation is not something that you can learn in a couple of days or say that you have already mastered it as much as possible. Like trying to learn to play guitar or training with collapsible dumbbells, a tangible result will appear only after years of persistent training. At the same time, too intense efforts in meditation are as meaningless as abrupt efforts to keep the balance on the rope. In the Eastern tradition, it is believed that a teacher is highly desirable for studying meditation. In past times, one could find out how to learn to meditate, only from a teacher, or from very rare the then books if there are certain innate abilities for meditation. As a result, the requirement of the need for a teacher for any disciple who wanted to study meditation has almost become a dogma. Nowadays there are new facilities for studying meditation. The scientific approach and studies of commonly recognized meditation masters with the help of electroencephalographs and fMRI enabled to learn interesting features of meditation. It turned out that it is characterized by a decrease in the beta-rhythm of the brain and an increase in alpha rhythm, and, with case of continued training in meditation, also an increase in theta rhythm. For the last 10 years, relatively cheap "household" versions of electroencephalographs have appeared that allow not only to track individual brain rhythms in the home, but also to show the presence of meditation itself. NeuroSky's EEG headsets were developed after extensive research of genuine meditation masters, including Tibetan monks, and show your level of meditation every second. EEG headsets are revolution in the study of meditation. They provide one more way to study it, in addition to the teacher and the text guide. The ready-made parameter "level of meditation" allows you to track the moments of entering the state of meditation, which previously could not be noticed by the disciple, and this can greatly accelerate the study of meditation. With the help of EEG headsets, you can faster master the basic dhyana, and in the distant future even shamatha, and then go on to various subsequent practices described in yoga and Buddhism in which dhyana and shamatha are used as a necessary basic requirement. 1. First you should learn to concentrate. If someone is unable to focus mind on one object longer than, for example, ten seconds, then such person probably will not succeed in keeping the mind without thoughts for a long time. Not to mention those who are prevented from concentrating for a long time, for example, because of ADHD. On the Internet, there are many guides and techniques for training attention and concentration, for example, fixing a look at a candle flame or a point on a piece of paper. 2. If you are able to keep the mind on one object long enough, then you will be able to successfully train thoughtlessness. It is easy to train at any time, when there is no need to talk or think, and, of course, when you once again remember the need for this training. This can be done dozens of times during the day, and this is one of the most effective approaches to training the silence of the mind - the preparatory stage of meditation. "My father always told all the new students, including me, that the most effective approach for a beginner is to calm the mind for a very short time many times a day." In addition, thoughtlessness has its own levels of subtlety, which also affect the level of meditation attained. Gradually you will begin to notice the moment of the appearance of thought and stop its manifestation in the mind at earlier stages of its emergence. Prolonged thoughtlessness in a state of wakefulness is the main prerequisite for successful meditation. 3. After you learn to keep the mind without thoughts, say, for 10 seconds, you can go to the practice of meditation itself. You need to take a stable position of the body, with which you do not need to strain any particular muscle group. The most optimal position of the body for meditation is not lying, when you quickly begin to experience drowsiness, not standing, when you will be too tense and active, but sitting. The back should be straight and vertical. The point here is not only in the ida, pingala and sushumna, but also that the straight vertical back is in optimal balance and requires the least physical effort to maintain its position and correct possible deviations. The minimum of physical activity is important for long-term successful meditation. The meditation posture should be comfortable. It makes no sense to sit in a lotus, if due to it in a few minutes you will begin to experience physical pain. Your meditation will only get worse because of such pain. At first it is recommended to meditate with closed eyes, as this reduces the distraction of the mind to external objects and its "noisiness". In addition, the activation of brain areas associated with the processing of visual information, activates the mind as a whole and can reduce the quality of meditation. In some schools of Buddhism it is recommended to meditate with half-closed eyes when you see only a small section of the floor in front of you. In this case, no new visual information appears, the activity of the brain and mind as a result is reduced, and not completely closed eyes prevent the sinking of the mind and drowsiness. Also, for transition into a state of meditation it can be helpful to direct the "sight" of the closed eyes slightly upward, especially in the case of increased activity of the mind. In addition, it is necessary to "defocus" the sight, even if your eyes are closed, as this will also reduce the activity of the brain and noisyness of the mind. With proper meditation, the level of "noisy" beta waves is reduced as a result of thoughtlessness of mind, and the level of alpha waves is increased as a result of thoughtlessness and maintaining the mind in a state of optimal balance between states of increased activity and fatigue / drowsiness (mind sinking). One of the key points of the dominant alpha waves - you should not even try to come up with a further topic for your thoughts. It is necessary to maintain such a fixed and steady clear mind as possible. It is said in the scriptures that the diet of meditator should be moderate. Experiments with the NeuroSky headset also show that stable high values of the "Meditation" parameter can appear only since 3 hours after consuming a large single amount of food. Gradual progress in meditation is possible only as a result of a long and proper practice. It may take years to keep the mind without thoughts for a minute or longer. External factors of society even can make it impossible to make significant progress in meditation. Summarizing, we can say that meditation is a state of thoughtlessness of a clear mind-observer who is not inclined to fall asleep and is not too excited. The further practice of meditation will allow you to gradually move on to new, more subtle levels of meditation and awareness. These levels are described in detail in Buddhism (for example, different kinds of samadhi). An excellent opportunity to track the stay in a state of meditation that has become available only in recent years is the use of the relatively inexpensive (about $100) NeuroSky MindWave EEG headset. Even before the development of its first version of the EEG headset, NeuroSky conducted long-term studies with the help of professional multi-channel electroencephalographs of meditative states of 14 different meditation masters, including Tibetan monks with large retreat experience. It is on the basis of these studies that a proprietary algorithm for calculating the "meditation" parameter was developed. The studies were similar to those described in this article. 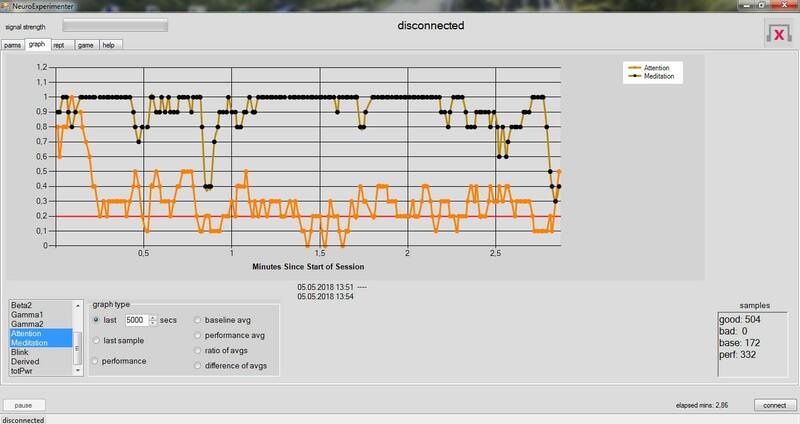 An example of a screenshot of the application NeuroExperimenter for the NeuroSky MindWave EEG headset. It should be noted that the use of the NeuroSky headset will not help in the study of meditation if a person is unable to keep the mind without thoughts, say, for 10 seconds. The values of the "meditation" parameter will chaotically jump, and it will be unclear how these values can be controlled at all. And the progress in meditation is very slow, and this can quickly lead to disappointment. In such a situation, one should practice the preliminary condition of meditation - thoughtlessness, and this is possible without any EEG headset. At the same time, an important feature of the NeuroSky EEG headset is that even with your prolonged thoughtlessness, it will show whether you are at this moment in a state of meditation that is not achieved only by thoughtlessness. Success in meditation requires daily practice, practice and practice once again. This is a translation into English of this article of the author of this site, 2018. The free 'EEG Meditation' app for Windows PC, for the white or black headsets. The arguments in favor of the use of EEG headsets, such as NeuroSky MindWave Mobile, for meditation.